Like in the real world, the income gap between the “haves” and the “have nots” of tennis continue to widen. The disparity actually exists even between the “haves”. I can offer some explanation for this. Geometric progression has something to do with it. A lot has been said about the income disparity between the have and have nots of tennis. I’m just talking about prize money here. 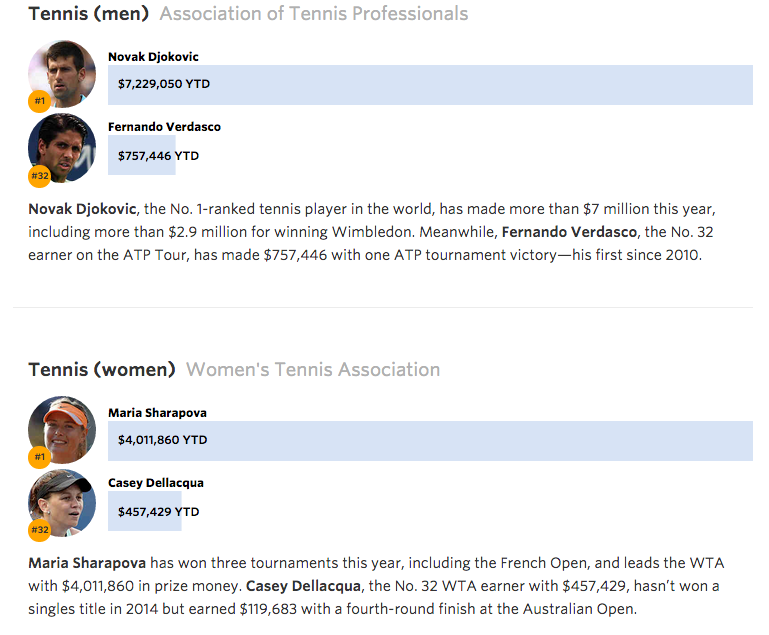 The disparity between endorsement money is a whole different ballgame… errr match (since we’re talking tennis here). Apparently, the disparity exists between the “haves” themselves. The Wall Street Journal ran an article last year regarding the income gap between the 1st and 32nd ranked tennis players, and compared that gap across a variety of professional sports. Note: The data from the wsj article is as of August 22, 2014. After the 2015 Australian Open, the no. 1 ranked male and female players are Novak Djokocic and Serena Williams respectively – they also both won the Australian. The no. 32 players are Fernando Verdasco (still!) and Coco Vandeweghe. 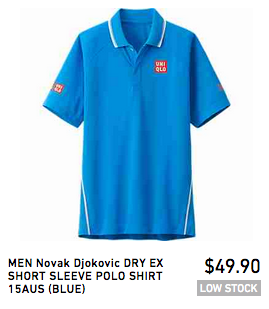 The Australian Open Finalists’ Outfits: The Sponsors Tell You to Buy Them Now! The 2015 Australian Open Men’s and Women’s Singles Finalists are playing for the championship. Get a piece of the action by wearing their outfits. Don’t know where to buy them and how much they cost? This post will help you. For two weeks, we have seen tennis players at the 2015 Australian Open wear the same outfits over and over again. There’s a reason for that. There’s also a reason why those clothes (or variations of them) are available in stores now. That reason is for you to buy them. That’s marketing for you. Some outfits looked great. Some outfits looked hideous. At the end of the day (or tournament in this case), only the outfits of the tennis stars matter. That’s why they are paid the big bucks. Federer and Nadal obviously got the best kits from Nike. Does anyone want to buy the outfits that handed Roger and Rafa early eliminations? Nah, I’ll pass on those. I’m buying what the winners were wearing. Continue reading The Australian Open Finalists’ Outfits: The Sponsors Tell You to Buy Them Now! Posted on February 1, 2015 Categories Market Phenomenon, Other Activities, PeopleTags Andy Murray, Australian Open 2015, Clothing, Fashion, Maria Sharapova, Nike, Novak Djokovic, Serena Williams, Sports, Tennis, Under Armour, Uniqlo1 Comment on The Australian Open Finalists’ Outfits: The Sponsors Tell You to Buy Them Now! This post is part of a series that is related to the ongoing Australian Open 2015 tournament. Sharapova and Sugarpova initially seemed to be a mismatch, but the combination actually makes sense. Health and sugar don’t match. In fact, in recent years, sugar has probably earned the unhealthy reputation of bacon. Look at what has happened to Krispy Kreme. A sport star is a bastion of fitness and if ever one will associate himself with a sugary product, the terms used will be “fuel”, “power” or “energy boost” rather than “sweet, “sugar” or “candy”. In 2012, when Maria Sharapova, a five time grand slam tennis champion, launched Sugarpova, a line of premium candies, many were perplexed with the move. Sharapova is the world’s highest paid female athlete, and she makes most of that money off the court by hawking products from Tag Heuer, Nike, Porsche, Cole Haan and other brands. What makes Sugarpova different from all those other brands is that it is actually Sharapova’s own business. She’s selling the candies on behalf of herself. Sugarpova is “premium” candy; in other words, more expensive than usual candies. A 5 oz bag of Sugarpovas costs around USD 5.99, many times more than usual candy brands. Not that these candies have something to be premium about. Most premium products boast using the finest ingredients, the finest manufacturing technique (finest being either ultra modern or handmade, but never the in-between), posh packaging, or luxurious buying experience. None of these are present in or claimed by Sugarpova. Sugarpovas are expensive because of Maria Sharapova. There have always been premium chocolates, but never premium candies. Who would have thought of coming up with premium sour balls or gummy bears? Apparently no one has, which is why Sugarpova occupies its own niche. There must be candy that’s worthy of selfies, instagrams and facebook posts. Sugarpova fills that void. 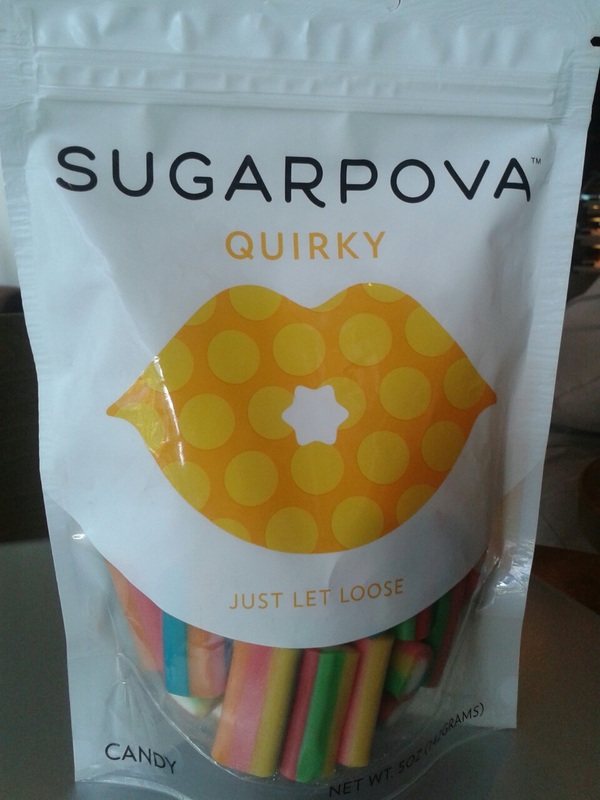 In its first three months of release, Sugarpova had sold around 250,000 bags. It has probably sold more than a million bags by now. That’s major, considering that these candies have limited availability. In fact, here in the Philippines, there’s only one store chain that carries it. I was lucky to get a bag here in Manila. The store I went to had only two bags. One is “Quirky Sour, the other is “Quirky”. Obviously, I didn’t have to ask what the difference between the two is… Actually I did. The sales lady said one was sweet, the other was sour. I went with the non-sour one.